Designing artificial organs and tissues, developing new drug delivery systems, creating or modifying innovative medical devices, or enhancing medical imaging techniques are just a few of the endeavors of a biomedical engineer to improve the health and well-being of others. The biomedical engineering degree combines the practice of engineering with knowledge of cell biology, anatomy, and physiology, to innovative solutions for a variety of health care problems. Biomedical engineering leverages the vast knowledge base of biology and medicine to solve problems focused on health care and the human body. Biomedical engineers design instruments, devices, and software; bring together knowledge from many technical sources to develop new medical procedures; or conduct research needed to solve clinical problems. They often serve a coordinating function, using their background in both engineering and medicine to collaborate with health care professionals on identifying a problem and designing a solution. Biomedical engineers are intimately involved in the development of devices and techniques to address issues to improve human health. The field is highly multidisciplinary, requiring expertise from a wide range of professionals, and in particular engineers from disciplines as diverse as chemical, electrical, and mechanical engineering. This is true whether in industrial, research, or clinical settings. A successful multidisciplinary team must have at least one member, a biomedical engineering, who possesses a comprehensive understanding of the highly variable and intricate nature of the biomedical system of interest, such as the heart or a prosthetic limb. Biomedical engineers must possess the quantitative and analytical engineering skills needed to precisely define the challenge that is being addressed and assess the effectiveness of any plausible solutions. The BS degree in biomedical engineering delivers a focused curriculum that targets the biomedical enterprise from a highly quantitative and analytically rigorous perspective. The goal is to enable participants to compete successfully for engineering-related positions immediately upon graduation or to pursue post-graduate education in engineering, science, or medicine. Students have the ability to contribute significantly to the development of new knowledge, understanding, and innovative solutions in the health care industry and across a wide variety of health care related research applications. Draw upon the fundamental knowledge, skills, and tools of biomedical engineering to develop system-based engineering solutions that satisfy constraints imposed by a global society. Work well both independently and collaboratively, as well as demonstrate strong leadership skills, accountability, initiative, and ethical and social responsibility. Be able to successfully pursue graduate degrees at the master’s and/or doctorate levels. Integrating cooperative education into the program for all students. Providing a strong foundation in mathematics and science with a balance between liberal studies and technical courses. 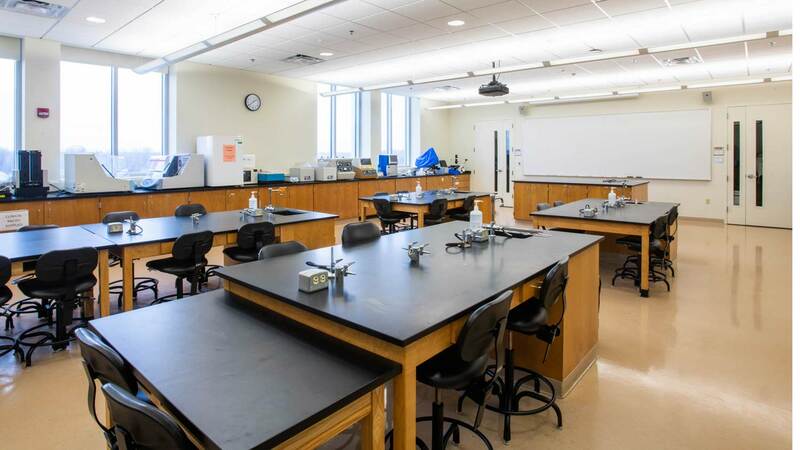 Incorporating a strong laboratory component in the program with outstanding laboratory facilities. Having a diverse faculty committed to engineering education. Biomedical engineering core courses – The curriculum consists of a core set of courses in science, technology, engineering, and mathematics (STEM) that address the essential aspects of engineering as a discipline and biomedical applications in particular. Recognizing that biological systems generally possess a significant degree of random behavior, a three-course sequence in statistical analysis, including design of experiments, is an essential component of the curriculum. There are foundation courses in general and analytic chemistry as well as cell and molecular biology, immunology, and biocompatibility. Professional technical electives – The program includes two free electives that allow you to choose courses from any college in the university. In the fourth or fifth year of the program, students choose two technical electives specifically related to some aspect of biomedical engineering, such as biomechanics, instrumentation and imaging, or tissue engineering. Technical and free electives can also be utilized to establish a minor course of study related to biomedical engineering. Cooperative education – An important aspect of the biomedical engineering program is one year of cooperative education experience. Beginning the summer after your second year of the program, you’ll alternate semesters on campus with full-time, paid work experience in an area of biomedical engineering that interests you. These full-time experiences enable you to apply what you’ve learned in the classroom to real world situations. Students also benefit from the chance to network with professionals in the field. Liberal arts courses – Courses that include writing, communications, and the humanities and social sciences comprise liberal arts course you’ll complete as part of the program. A three-course immersion is also required. The immersion can enhance your biomedical engineering studies, or be a topic of personal. Free electives – Courses chosen by you, these free electives provide you with the opportunity to choose additional course work to enhance a personal or professional interest. Multidisciplinary senior design – The biomedical engineering major culminates in the fifth year with a two-course multidisciplinary senior design experience. This capstone design course integrates engineering theory, principles, and processes within a collaborative environment that bridges engineering disciplines. Learn more by exploring multidisciplinary senior design. The BS program in biomedical engineering is accredited by the Engineering Accreditation Commission of ABET, http://www.abet.org/. Visit the college's accreditation page for information on enrollment and graduation data, program educational objectives, and student outcomes. This course will provide an overview of the discipline. The students also have an opportunity to interact with their curricular adviser and obtain a clear understanding of the program and the possible curricular options. It will consist of the following components: 1) Overview of the discipline including an introduction to relevant literature, organizations, examples of successes, on-going challenges and possible new opportunities. 2) Introduction of an engineering methodology applicable to biomedical problems. 3) Opportunity to address a simple biomedical engineering related problem that necessitates problem statement, research, solution proposal and summary report and presentation of results. 4) Introduction to team dynamics, organization and interpersonal communication associated with working with a multidisciplinary team. This course is an introduction to the structures and components of the human body as well as their basic functionality. Essential elements of human anatomy and histology will be presented and students will be encouraged to correlate their structure and function with non-human structures and devices that might be considered as replacements or improvements. Fundamental concepts in biomechanics will be introduced and integrated with relevant topics from physics. Variability in dimensions and the concepts of normal and exceptional ranges of values in terms of populations will be introduced and how they need to be accounted for and accommodated. A first course for biomedical engineers introducing units, physical properties, dimensions, dimensional analysis, data analysis and data presentation for engineering, stoichiometry of biological reactions, simple material and energy balances for batch and continuous systems in steady and unsteady states. This course provides the students with the essential skills required to analyze biosystems, and special focus is given to developing problem solving skills with a biological context. This is the first course of a two-course sequence designed to introduce biomedical engineering students to the molecular and cellular basis of life with a particular emphasis on the integration of molecular systems that underscore human physiology. This course will start with the basic chemistry of biological macromolecules and then explore the cell starting from the nucleus and moving outward. Major topics will include: DNA replication; molecular basis of inheritance; the biology of RNA; gene expression; protein synthesis; the secretory pathways; and enzyme kinetics. This is the second of a two-course sequence designed to introduce biomedical engineering students to the molecular and cellular basis of life with a particular emphasis on the integration of molecular systems in human physiology. This course will continue exploring sub-cellular systems by touring the function of each cellular organelle and describing the pathologic consequences that result from interruption of its normal function. Major topics will include: cellular energy production; the cytoskeleton; the lysosome; the plasma membrane; vesicle transport; cell-cell communication; signaling pathways; the cell cycle; and cell division. This course is intended to provide an overview of materials used in biomedical applications, both internal and external to the human body. The specific objective of this course is to present the principles which apply to the properties and selection of materials used in medical applications. Topics include an introduction to deformable mechanics and viscoelasticity; structure and properties of metals, ceramics, polymers, and composites; fundamental composition of biological tissues; and principles associated with the interaction between biological tissues and artificial materials. This course exposes students to the fundamentals of static and flowing fluids at both large-scale (control volumes) and local differential scales. Student learn how to examine forces on solids due to static and flowing fluids, estimate head losses and pumping requirements in piping systems. The art of engineering approximation is examined through estimates of forces due to flow on solids, as well as limiting cases involving internal pipe flows with friction factors. Exact solutions of local differential equations of fluid mechanics are considered under both steady state and transient conditions, and these analyses are used to determine forces in control volume analysis of bodies. The important interplay between differential and control volume analyses in solving problems is emphasized. Lastly, students are taught to make analogies about the concepts learned in generic fluid mechanics and apply them to the circulatory system, while outlining appropriate limitations. This course begins a two-course sequence designed to provide students with a broad foundational understanding of physiological mechanisms from a systems perspective. This first course in the sequence is concerned with the fundamental aspects of cellular function including maintenance of homeostasis, molecular transport, and cellular signaling. The course covers the basics of electrophysiology, electrically excitable cells and tissue, the operation of the nervous system including the central, peripheral, somatic and autonomic systems, the special senses and the connection between the nervous system and the endocrine system. Differences and relationships between speed, specificity and sensitivity of signaling mechanism of the nervous system and the endocrine system will be discussed. Students will also be introduced to the basic principles of biomedical instrumentation used in cellular physiology research. Introduction to and application of signal processing techniques to evaluate and manipulate continuous and discrete time signals presumed to originate from systems that may be either linear or non-linear, time invariant or varying and random or deterministic in nature. Representative data sets will be used to characterize and process signals from physiological systems and processes. A multi-week project will be assigned that will consist of processing and analysis of a typical biomedical signal source to provide a robust and consistent evaluation of some aspect associated with the signal source based on methods discussed both in class and reported on in the literature. This course combines a traditional basic immunology course with an introduction to principles of the human tissue response to biomaterial implantation. Information is presented in the context of common immune system pathologies to emphasize the relevance of immunology to biomedical engineering and human physiology. Major topics include the organization of the immune system and its myriad cells and cytokines, a review of bacterial and viral lifecycles, antibody/antigen specificity, inflammation, bacterial adhesion, biomaterial surface characterization and sterilization. Students explore biocompatibility testing, and learn the molecular basis for surface recognition and masking in implanted materials. The course emphasizes the interaction of various immune system components with engineered biological devices, implants, cells and tissues, and explores strategies and solutions for maximizing biocompatibility of engineered biomaterials with the immune system. This course is an introduction to medical devices and includes engineering and regulatory issues that are unique to these devices. Course content includes applying engineering analysis skills from prior coursework to analyze the function of medical devices. Course content also includes some historical background, an overview of existing devices and Last revised 3/25/16 2 trends, material selection, interfaces of medical devices with biological tissues, product testing, reliability, and regulations specific to the design and validation of medical devices. A substantial part of the course is a project, in which students will be required to work in teams to complete a design iteration of an existing device, including appropriate analysis and documentation. Laboratory experiments are conducted to explore and reinforce fundamental principles and concepts introduced in BIME-410 (Systems Physiology I) and BIME-440 (Biomedical Signals and Analysis). The experimental procedures involve measuring results, analyzing and interpreting data and drawing objective conclusions. Emphasis is also placed on proper documentation and effective presentation of findings and results. Laboratory experiments will be conducted to investigate pressure, volume and flow relationships of the cardiovascular and respiratory systems including the inherent variability and dynamic response to perturbations. Signal processing methods will be utilized to address ubiquitous artifacts found in measured physiological signals. Application of engineering analysis, modeling, problem solving and design skills to characterize and manipulate the operation of biomedical systems for the purpose of remediating, supplanting, replacing or enhancing the function of physiological processes. This presumes that those same tools and skills can be used to model the observed and/or known function of the physiological systems and processes under consideration. In addition to lectures, homework and examinations, the course will a project oriented assignment to design and evaluate a model that faithfully duplicates and predicts the operation of that process or system. An accelerated dual degree option is available for outstanding undergraduate students who wish to earn both a bachelor's and a master's degree in approximately five years. The “BME Careers” seminar series helps students learn more about the field through the experiences of other students, faculty, alumni, and working engineers. The series provides resources that will help them succeed at RIT and in the work force. Questions such as “What can I do as a BME?” and “How does your company use BMEs?” are complicated. Rather than explore these questions in a single session, we’re using this seminar series to help students explore these questions over the course of the year.